Impex Fitness is going forward on doing innovations in today’s fitness marketplace. The equipment in which they are specialized in are smith machine, home fitness style equipment by which the whole family can catch benefits of healthy workout experience. Impex also surrounds itself with variety of brands like Competitor, Marcy, Easy Outdoor, Hers and Gym Dandy for children. Impex knows that the family’s health is the first and highest priority to maintain and with that understanding, Impex fitness puts great effort of creating a new and innovative fitness equipment. Just like they created Marcy Standard Hollow bar kit. The Marcy Standard hollow bar kit consist of great features and benefits, not only the items included in the package are affordable, but also they are durable, reliable and ergonomic weight bars. In a set there is one forty seven inches curl bar is included which is very standard and is constructed with solid chrome steel. 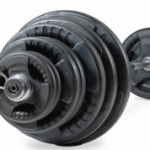 Along with that there are two fourteen inch hollow dumbbell handles included which also consist of chrome plating. Six spring lock collars are included in the set, to make the griping of weight plates tight enough and prevent clanging while lifting. The dumbbell’s handles and Curl bar have the capability to fit any two inch weight plate. The package is backed with two year manufacture warranty against bending or breaking. 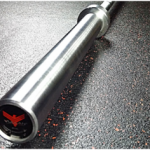 A high quality EZ curl bar is very rare to found in today’s expensive and dreadful quality barbell market. 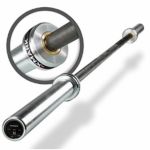 Marcy Fitness by Impex fitness comes with a new standard hollow bar kit, which consist of one forty seven inches hollow chrome steel standard curl bar, with two fourteen inch hollow chrome handles for dumbbells and around six spring lock collars all in standard dimensions and shape. Not only these components are affordable but also they provide great durability, functionality and accessibility. The hollow bars are made using superior quality steel chrome, which gives greater longevity and prevents the bar from getting rust and corrosion. 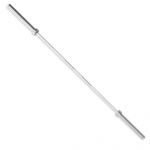 Chrome is considered one of the best material for creating and coating barbells. It is due to the fact that chrome prevents rust and corrosion big time then phosphate and oxide coated barbells. Along with rust resistant, the Chrome is reported to have less oxidation rate which makes the bar accessible in humid regions. However, it is still recommended to properly clean and maintain your barbell. Though, chrome is said to be maintenance free, but still for user convenience, it is recommended to light coat the bars with WD-40 and three in one oil to maintain its look and design. The weight of the curl bar is three pounds, which I think is very standard and best especially for beginners and women. The curl bar is normally used for biceps and triceps. Good strength is required to lift up the barbell properly because due to curling, the barbell produces great spin of the plates. So having a minimum weight is best for a Curl barbell. The Marcy curl barbell has the ability to withstand eight to nine weight plates at a time with a diameter of two inches. 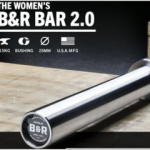 Not only the bar, but the dumbbell handles are sturdy enough to withstand heavy weight. The weight capacity of the barbell is 120 pounds, which I think is a very surprising stuff to see from a three pound curl bar. The dumbbell hollow bar included with Marcy package are also very durable and have the capability to handle weight up to 80 pounds. It is better to buy these dumbbells as they are adjustable enough to change the weight plates more often than buying a specific dumbbell for each weight set. Also, it saves your workspace and gives you independency of taking them anywhere. The bar has a length of forty-seven inches which is mostly used to pump up your biceps through curling. With moderate knurling and dual knurl mark, the bar is able to give a secure and comfortable grip that doesn’t damages your hand while lifting heavy. The knurling done on the curl bar fits perfectly on your hand, though you can still use gloves to makes it more rigid. The spring lock collars are made of good steel and fits the weight plates on to the collars, very firmly without any clang. Also, the bar is certified with standard IWF markings so every standard plate can fit in it very easily. 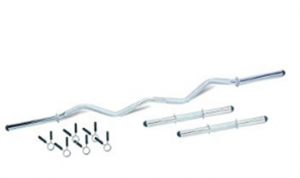 The Marcy standard hollow bar kit comes with a two year manufacture warranty, which covers every part and internal defect that is present, and creating difficulties for you to work out. You can see how Marcy is backing up with its product, by providing excellent customer services and taking user queries, feedbacks and complains seriously. The weight of the curl bar is three pounds. The weight of the dumbbell bars are 2.5 pounds each. 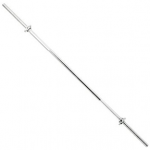 The dimensions of the barbell is 47 by 5 by 3 inches. The length of the dumbbell handles is fourteen inches. The bar have a weight capacity of 120 pounds. The bar is constructed with solid chrome steel. Six spring lock collars are provided with the kit to make the weight places stay in their place. 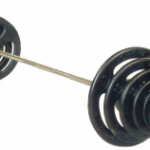 The hollow bars are compatible with any two inch weight plates, which is to be purchased separately. Comes with a two year manufacturer warranty against bending or breaking. The size and dimensions are kept very standard. The color of the hollow bar is silver. In my opinion, the Marcy Standard hollow bar kit is a very affordable set of barbells, which comes with a curl bar, dumbbell handles and spring lock collars. The quality of each component isn’t really compromised and is done with steel chrome. When I purchased this set for my son, the kit came in good packaging which was arrived within two days. The kit came in a sturdy box and after opening it I found that the curl bar, dumbbells handle and spring lock collars are all in a good shape. Though the collars had a bit of rust, but that thing is okay with a lower priced barbell kit. The experience with the curl bar was very good, the spin of the collars was very repetitive and was providing good momentum on lifting the barbell in heavy sets. The Chrome coat looked very eye warming. There was an issue of changing the weight plates as the ends were not properly constructed. Weight capacity should have been increased further to make this kit accessible to professional weightlifters also. Overall, an affordable and high quality purchase, and fully recommended for beginners. Comes in a very affordable price. Six collars, forty seven inch bar and dumbbell handles are included in a very low price. EZ curl bar targets the biceps more often. The chrome construction prevents the bar from rust and corrosion. The starting weight of the curl bar is very less which works really well for beginners and women. Weight capacity of only 120 pounds isn’t really best for professional weightlifters. End of the hollow bar aren’t really constructed well. Spring clips looks very cheap and doesn’t prevent rust. Loading/Unloading the weight plates creates a lot of stress.